Bailieborough Drama Group have now qualified for the All-Ireland One Act Drama festival having won 2nd place in Monorhamilton on Sunday, November 18th with their play ‘Smile Handsome’ by Liz O’Hanlon. Liz also won Best Actress on the night. The All-Ireland’s take place on December 7th/8th and 9th in Kilmuckridge, Co. Wexford. As a warm-up to participating in the Finals, the play will be performed in the Bailie Hotel on Sunday next, December 2nd, at 8pm and will they will be joined by Millrace Drama Group, Mullagh with ‘None the Wiser’ directed by Irene Yore. Tickets for the event are priced at €10 and are available from the Bailie Hotel or pay at the door on the night. The group will then go to Shercock on Thursday, December 6th and perform with Sillan Players with their performance of ‘The Long Wet Grass’ which has also qualified for the finals. We wish both groups every success in the final. Lakelands Arch Club is a social outlet for children/adults with special needs and their family and friends. You can play, sing, dance or simply have a chat with others. If you wish to join as a member/volunteer call/text 086-2543336 for more information. We are holding our Christmas Party on Wednesday, 28th November from 7-9 in the BDA Centre, Shercock Rd, Bailieborough. Its promised to be an evening of fun, games, music and dancing, maybe even a special guest! All the Confirmation Candidates from St. Annes and St. Felim’s National Schools will be participating in the Vigil Mass next Saturday evening at 7.00pm, in St. Annes Church. At this Mass the first candle on the Advent Wreath will be lit. Safe pass Saturday 1st December 2018 from 8am -4pm, lunch included €100. Bailieborough Business Centre 042-96 94 716. Deepest Sympathy is extended to Aiden King and family, The Vale on the recent death of his mother Rose King, Poles, Cavan whose Funeral took place in Laragh on Friday last. A Charity Sale in aid of the St. Vincent DePaul will be held in the Community Centre on Sunday next, December 2nd from 10.00am to 4.00pm. There will be lots of Christmas Gifts available, children’s books, toys and many other items. Admission is free and everyone is most welcome. If anyone would like to volunteer to help out for a few hours, please contact 087 4407 990. The Bailieborough branch of the St Vincent’s de Paul are hosting a ‘Fashion Show’ on Thursday next, 29th of November at 7.30pm in the Hotel Bailie. Doors will open at 7.15pm and we will be modelling a vast array of the clothes, that are for sale in the shop on Main St. Tickets for the event are priced at €10 for a fantastic, fun filled evening ending with a disco after the Fashion Show until 12.30am. There will be an opportunity to buy after the show, so you can have a special Christmas outfit at a very reasonable price! We look forward to seeing you there and your support would be greatly appreciated. Bailieborough School of Music: Lotto results for 24-11-2018. Numbers Drawn; 4, 10, 28, 30. No Jackpot Winner, Lucky Dip (€25) Winners; Walter Bourgoin; Geraldine Cosgrove; Damien Stafford; Liz Sheanon. Jackpot next week, €1,900. The next get-together of the Bailieborough Social Day Group will take place on Wednesday, November 28th from 2.30pm to 4.30pm, in the Community Centre. Tickets for the Christmas Party will be available on the day. New members are always most welcome. As part of the Christmas Lights switch-on, taking place on Saturday, December 1st, Bailieborough Library are having a Story Time and Crafts day. Christmas Storytime for children aged between 4 and 8 from 2.30pm to 3.1pm and Christmas Crafting (Booking Essential) from 3.30pm to 4.30pm. Please come along and support. Bailieborough Community Alert are hosting a ‘Property Marking Event’ from Thursday, November 29th to Tuesday, December 4th. The machine will visit different townlands and areas and booking is essential as there is limited availability. Call Alison on 089 439 5654 to book a slot, when the machine is in your area. You must submit your Eircode. For further details, please contact Kevin Carolan, Pine Grove or Seamus Sheridan, Kells Road. Bailieborough Branch: The Christmas Community Dinner Party will take place in the Hotel Bailie on Wednesday, December 5th at 6.30pm. Anyone interested in attending, is asked to contact Julie at 086 8968 928 or Helen at 087 7531 658. Admission is €10 per person. On Christmas Day, the 25th Christmas Day Swim will take place in Bailieborough Town Lake. All proceeds will go to the Senior Citizens’ Day Group. Tickets will be on sale this Friday in Super Valu, Bailieborough. Any inquiries to Brendan 0872758890. Beginners Yoga in Bailieborough Leisure Centre: Every Saturday from 9.30am to 10.30am. Bring a Yoga mat and an open mind. Wear comfortable clothing. The proceeds from next Saturday morning’s class will be in aid of ‘Aware’—the suicide charity. Contact Darren Clarke 086 846 9581 or darrenclarke@campue.ie for further information. Bailieborough 10:30am – Confirmation Service. The following are the available dates for Baptisms in St. Anne’s Church–November 25th (Sunday, 12.30pm), December 15th (Saturday 1.30pm), December 23rd (Sunday. 12.30pm), January 13th (Sunday, 12.30pm) and January 26th (Saturday, 1.30pm). Under 7/9/11; All back in full swing indoors now. 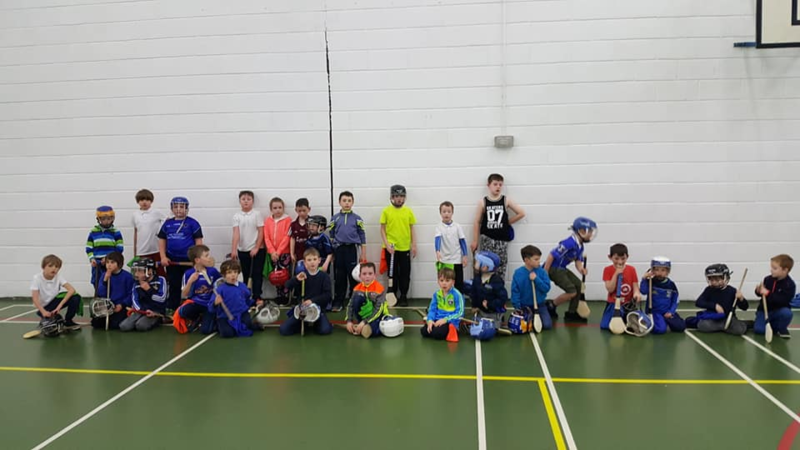 Thursday in Kingscourt and Friday two groups in Bailieborough. Great numbers heading toward December! 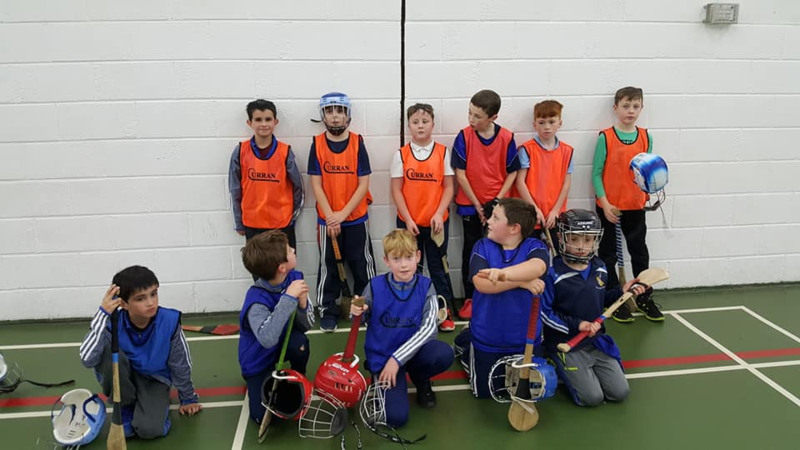 Above; Fridays U11 group in Bailieborough. These lads are now finished for the year. We would like to thank them for their commitment this year and congratulate those who won both Feile and U15 league this year. Lots of promise in this squad which we hope will continue into 2019. Thanks to our coaches Colin, Ben and Willie for all their work all year. These lads are now also finished for the year. We thank them for their continuing commitment and recognise their success in both Feile and in the Monaghan league and were only a puck of the ball away from the Cavan Championship. We look forward to 2019 with these lads. Well done. Again these lads are now finished for the year. Planning for 2019 is well under way. Knockbride bowls club recently held a successful pairs tournament with over 80 pairs taking part. 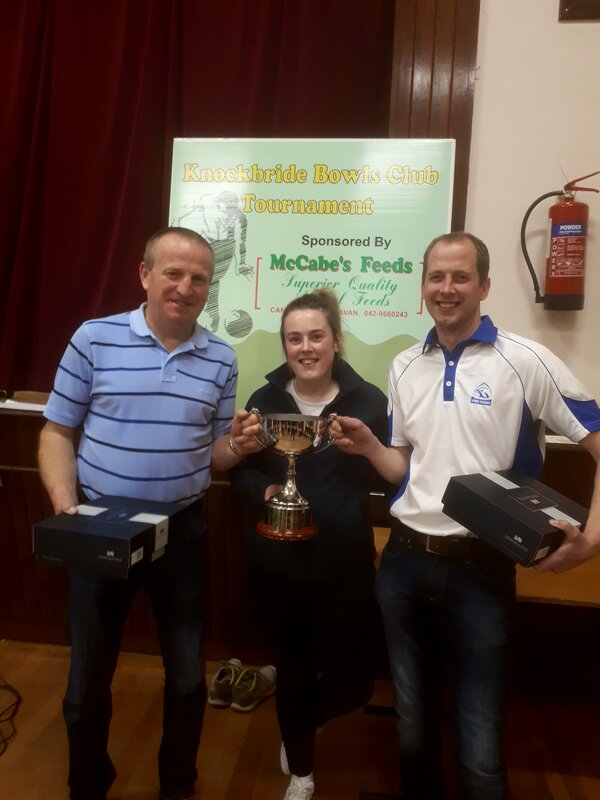 Pictured above are the winners Colin Dunwoody and Steven Clarke of Armagh bowls club being presented with the cup by Rachael McCabe from McCabe feeds who sponsored the tournament. http://bailieborough.com/wp-content/uploads/2015/09/bborocomlogo2015-300x130.png 0 0 Lee McDonnell http://bailieborough.com/wp-content/uploads/2015/09/bborocomlogo2015-300x130.png Lee McDonnell2018-11-28 13:18:032018-11-28 13:18:03Bailieborough News. November 26th 2018. Matthew J. Cullen. Bailieborough News. November 19th 2018. Matthew J. Cullen. Bailieborough News. December 3rd 2018. Matthew J. Cullen.